The detection and analysis of toxic gases are of great importance in many areas, including the monitoring of air quality, the safety of workers in industrial plants, the control of industrial processes and the protection of the population against terrorists’ chemical weapons. Due to the large number and variety of toxic pollutants and the lack of a universal detection system, numerous methods and techniques have been proposed. However, most of the available techniques have several drawbacks in terms of the required high sensitivity and/or selectivity, and/or fast sampling time, especially when it is needed to detect low level of gas in the part per billion (ppb) range. Moreover, when these requirements are met, the resulting price is often prohibitive. Therefore, the development of versatile sensors which can be easily adapted to the detection of a wide range of pollutants is an important and significant challenge. To this end, the “Chemical Sensors” team had proposed new ideas based on chemical sensors and had developed new strategies aimed at improving the trapping and detection of the pollutants. 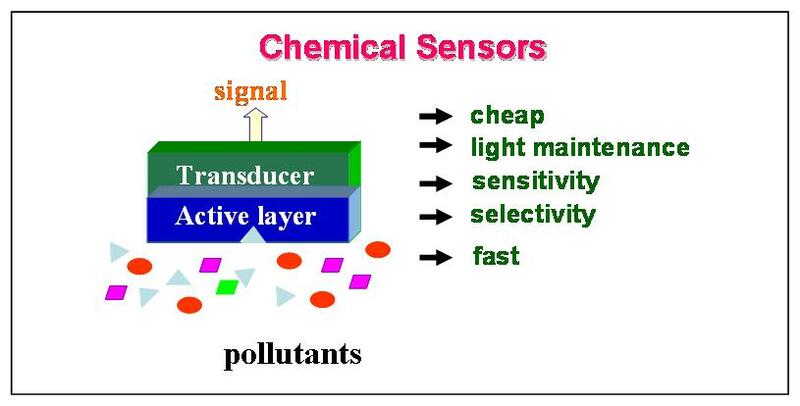 What is a chemical sensor? 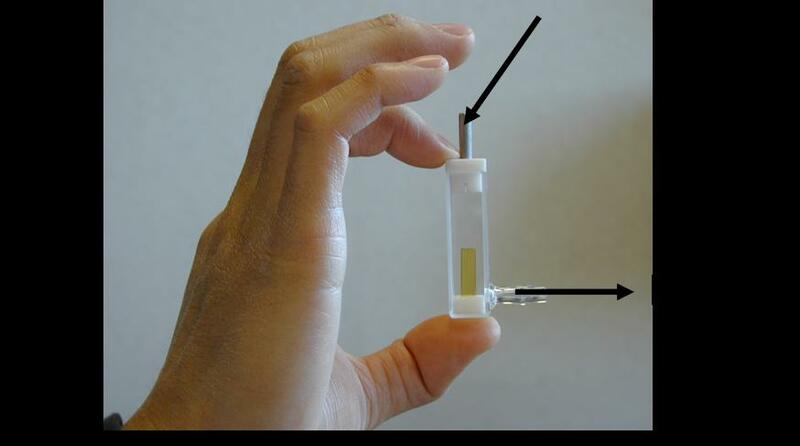 A chemical sensor is composed of an active layer and a transducer. The active layer represents the main part of the sensor. Many materials such as organic, inorganic or hybrid organic-inorganic polymers can be used as active layers, providing that pollutants can diffuse into the matrix and be trapped, thus modifying the physical or/and chemical properties of the material. 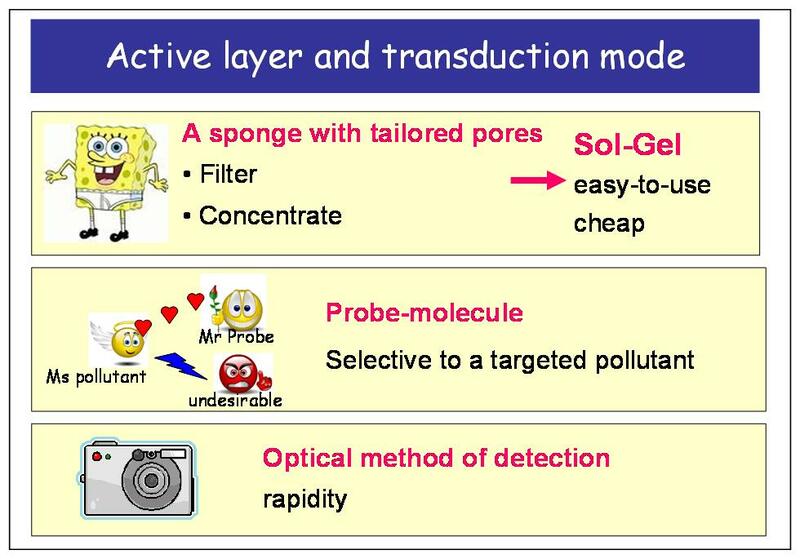 The active layer can also be doped with specific probe-molecules able to react selectively with the targeted pollutants, thus providing the selectivity of the sensor. The transducer role is to convert the variation of a physical property (i.e. refraction index..), or a chemical interaction (i.e. H-bond formation, electrostatic interaction…) or a chemical reaction (covalent bond formation) into a measurable signal (optical, electrical, electrochemical, piezoelectrical, etc…) proportional to the pollutant concentration. The requested properties of a chemical sensor are a good sensitivity (ppb level), a good selectivity, fast sampling time (<15 min), a reduced maintenance and a low cost. • the use of nanoporous transparent matrices as active layers. The size of the pores of the porous matrices can be tailored for a selective trapping of the pollutants. The matrices act as filters and provide a first selectivity based on the size of the pollutants. Moreover, thanks to their storage capacity, they act as sponges and concentrate the pollutants within the pores, thus enhancing the probability of their interaction or reactive collisions with the probe molecules. These porous matrices are elaborated via the Sol-Gel process, an easy-to-use and cheap method of synthesis. • Optical methods of transduction based on absorption or fluorescence measurements provide the fast response of the sensor. The Sol-Gel process allows the elaboration of porous matrices with tailored nano-holes. The process starts with the preparation of a Sol, a solution composed of various ingredients such as ethanol (an alcohol), water and acid (Chloridric acid) and the main reactant, tetraethoxy silane (TEOS). TEOS is a molecule which displays 4 functional arms (O-C2H5). In the presence of water, the arms (O-C2H5) are transformed into new and very reactive (O-H) arms, via a reaction called « hydrolysis ». The resulting compounds Si(OH)4 are particularly friendly and sticky and as soon as they encounters a neighbour, they will interact together to form a Si-O-Si bridge, which will link them together. The reaction is called « polycondensation ». The continuous formation of bridges among the population of Si(OH)4 induces the formation of a polymeric tri-dimensional network. 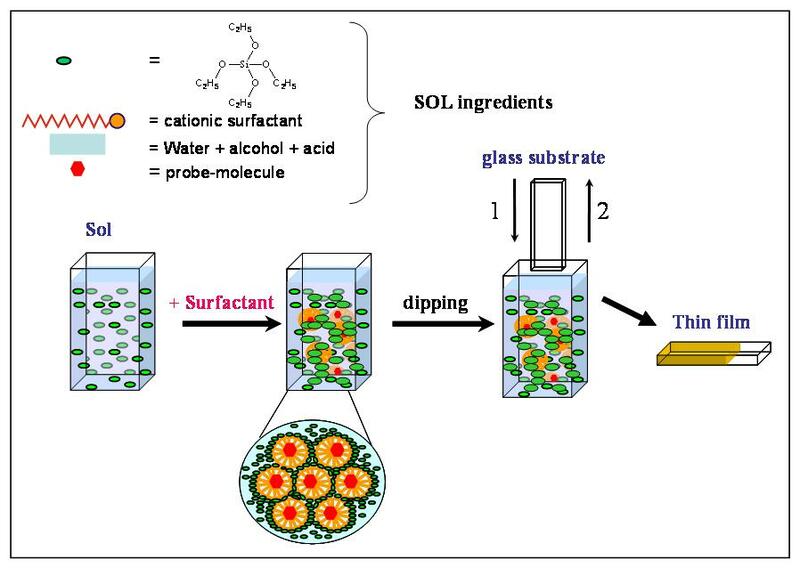 At this stage and before the Sol turns into a Gel because of the increasing viscosity, the probe molecules are added in the solution together with surfactant molecules. The cationic surfactant molecules display a long hydrophobic chain and a hydrophilic head. Therefore, in the Sol, the molecules reorganize themselves into spherical micelles or aggregates, the size of which depends on the length of the hydrophobic chain. The probe molecules are incorporated within these micelles. To obtain a thin film, a glass substrate is dipped into the Sol and withdrawn at a constant speed. During the withdrawal process, the Sol becomes a Gel and the micelles are entrapped in the gel network. After being dried, the film was washed with ethanol to remove the surfactant molecules. The cavities formed by the surfactants are then freed and are now ready to trap the targeted pollutants. A doped film is here shown. It is inserted into a flow-cell for exposure to a gas mixture containing pollutants. The flow-cell is equipped of a gas entrance and a gas exit connected to a pump. To expose the sensor to mixtures of gas containing the targeted pollutant, an important step is the generation of calibrated gas mixtures. For pollutants being either liquids or solids in their pure state, it is necessary to generate their vapour. To achieve this goal, permeation tubes covered with a porous membrane and filled either with the liquid or solid pollutants are heated at constant temperature in an oven. The oven is flushed with a continuous and fixed flux of nitrogen gas coming from a nitrogen tank. The gas mixture containing the pollutant is then diluted via mixing the stream with more nitrogen. The amount of gas is controlled via the flow meter. When very low level of the pollutant is needed, the gas mixture can be diluted a second time with the second stage of dilution. The final gas mixture is then pumped through the flow cell for the sensor exposure. To reproduce the humidity of the atmosphere, injection of water vapour can be achieved before the gas mixture reaches the flow cell. 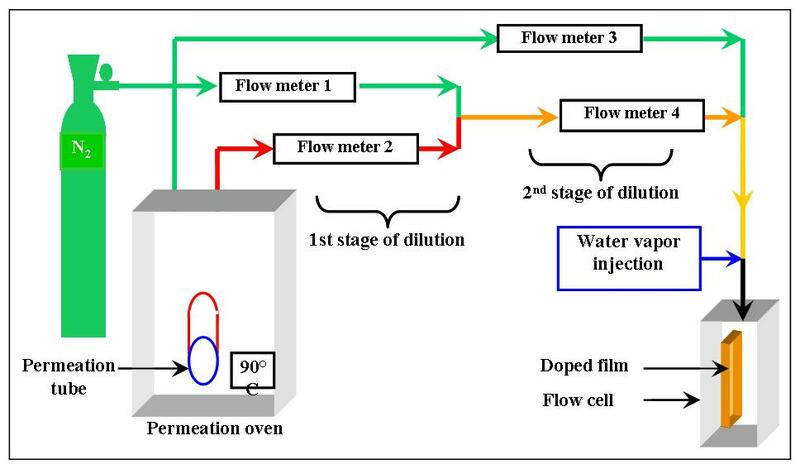 You have seen all the steps necessary to produce films doped with probe molecules, to generate calibrated mixtures of gas and to build a detection system. You are now ready to see an example of application to the detection of formaldehyde, a ubiquitous and carcinogenic indoor pollutant. Why is it so important to detect and quantify the level of formaldehyde in the atmosphere?. The emission sources of formaldehyde are numerous. The outdoor source is essentially due to car exhaust and in a minor part to release from trees. Formaldehyde is one of the well-identified volatile chemical contaminants responsible for indoor pollution and “building sick” syndrome disease and was recently classified as carcinogenic. It most significant use in the home is as an adhesive resin in pressed wood products and urea-formol foams for isolation, the latter being regulated for its emission. Due to its fungicidal properties, it is also used in detergents and cosmetics and in tanatopraxy (embalmment of a corpse). It is also present in cigarette smoke. 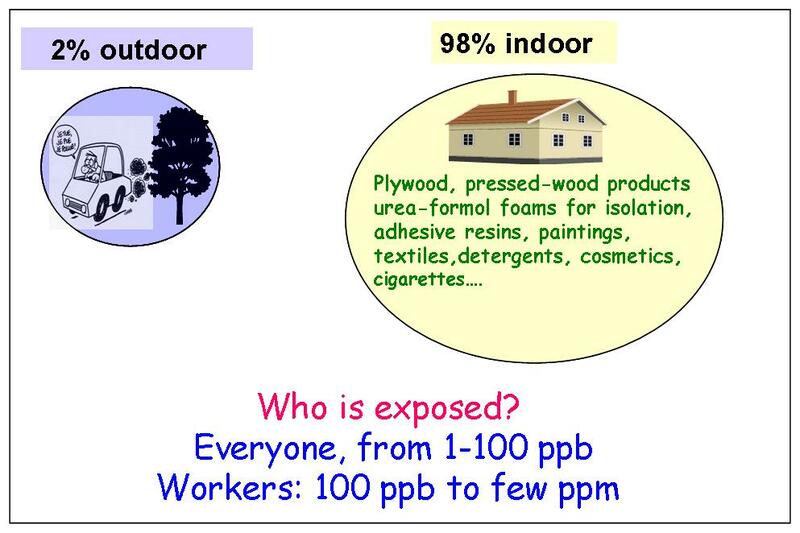 As most of the population spends 80% to 85% of their time indoor, everyone is exposed to formaldehyde at concentrations which can vary from 1 to 100 ppb. For workers in industrial plants or in laboratories, the exposure level is higher. – 8 ppb chronic exposure !!! There is currently no regulation for air quality but only recommendations by the World Health Organization (WHO) and the Agency for Toxic Substance and Disease Registry (ATSDR) for a limit of 80 ppb over 30 minutes exposure or 8 ppb for a chronic exposure , respectively. In France, the AFSSET (Agence Française de Sécurité Sanitaire de l’Environnement et du Travail) recommends 40 ppb for an exposure over 2 hours and 8 ppb for a chronic exposure. The numerous campaigns of measurement of formaldehyde around the world had demonstrated that the average level of formaldehyde in indoor air in homes is around 25 ppb but can vary from 1 to 100 ppb, especially in schools. The human olfactive threshold is high and can vary from 50 to 1000 ppb. This means that it is impossible for us to detect the indoor level of formaldehyde without the use of a dedicated instrument. The major symptoms are eyes, nose and throat irritations. It also induces asthma especially for children. For workers exposed in industrial plants, the nasopharynx cancer is a recognized exposure induced disease. Formaldehyde was classified as carcinogenic to human since 2004 by the Institute of Research on Cancer. The porous thin films are doped with Fluoral-P, a probe molecule which reacts selectively with formaldehyde to form a cyclic compound, 3,5-diacetyl-1,4-dihydrolutidine ( DDL). The optical properties of the product (DDL, figure on the right) are very different from the reactant ones (figure on the left). The absorption spectrum of DDL displays a visible band over 340-480 nm which can be used to measure the amount of formaldehyde which had reacted with fluoral-P. 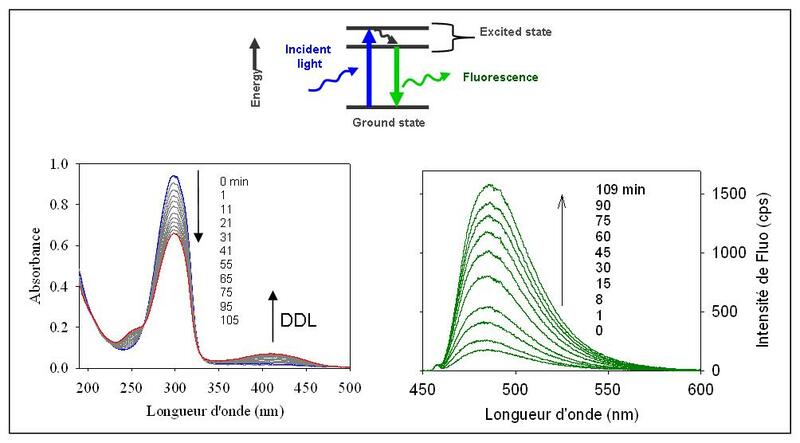 Moreover, DDL fluoresces when it is irradiated in the visible absorption band (450-700 nm) and thus the fluorescence appearance and growth can be directly and quantitatively related to the amount of formaldehyde which had reacted with fluoral-P. Films doped with Fluoral-P and exposed to a gas mixture containing 10 ppb CH2OOn the left figure is shown an example of the collection of spectra during the exposure of the porous film doped with Fluoral-P to a gas mixture containing 10 ppb of formaldehyde. At the beginning, before the exposure, the spectrum (blue) corresponds to the absorption spectrum of Fluoral-P. As soon as the film is exposed to formaldehyde, the intensity of the absorption band of Fluoral-P decreases and new absorbances appear and grow in intensity with time. These new absorption bands correspond to DDL, which is formed by the reaction of Fluoral-P with formaldehyde. By measuring, for instance, the growth of the absorbance at 420 nm, one can determine the amount of formaldehyde which has reacted fluoral-P. Similarly, during the exposure, one can irradiated the film over the 350-450 nm domain of wavelength, where DDL absorbs. The DDL molecules by absorbing the radiation are brought into a higher energy in an “excited state” from which they come back to the ground state with emission of a radiation. This phenomenon is called fluorescence. The right figure displays the fluorescence spectra of DDL collected as function of time. 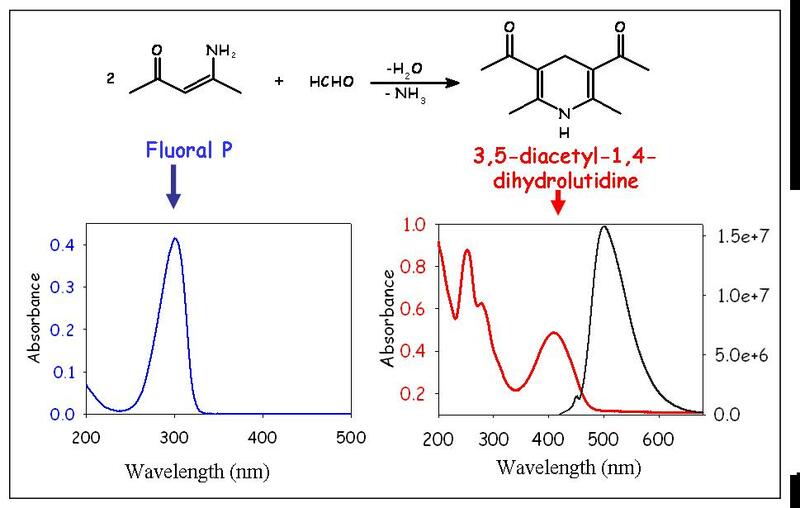 The growth of the fluorescence intensity of DDL as a function of time can be directly connected to the amount of formaldehyde which has reacted with fluoral-P. The growth of the fluorescence intensity per time unit is proportional to the formaldehyde level in the gas mixture. 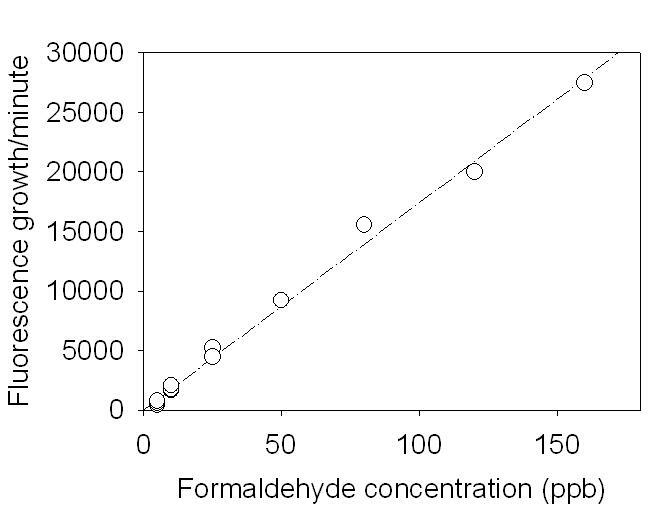 Therefore this plot can be used as a calibration curve to determine the concentration of formaldehyde in any environment, providing that a film is exposed to the unknown atmosphere and the fluorescence intensity is collected as a function of time. Calibration curves are established as functions of the relative humidity of air (0 to 70%) and temperature (-5° to 55°C). 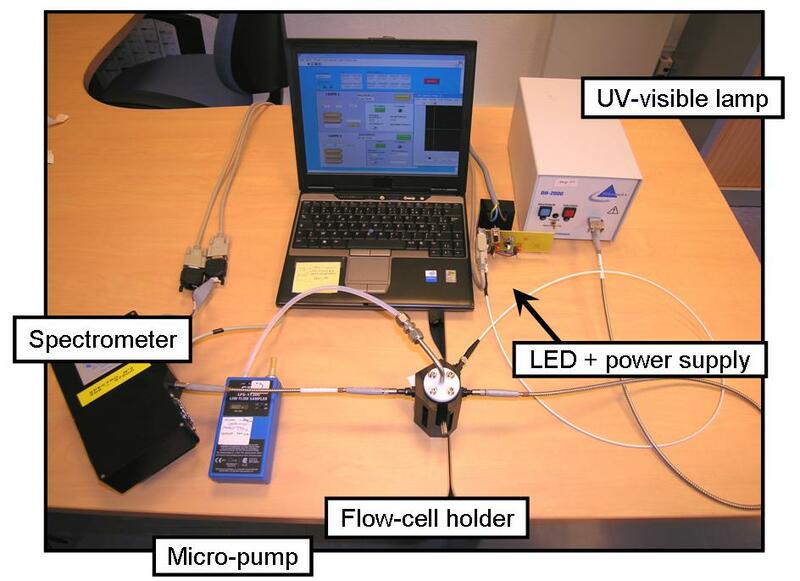 The laboratory first prototype is very convenient for the studies of various pollutants as the light sources could be adapted to each probe molecules and pollutants. However, it is composed of various units which are not easy to transport from one site to another. Therefore, a miniaturized and entirely automated system was needed. 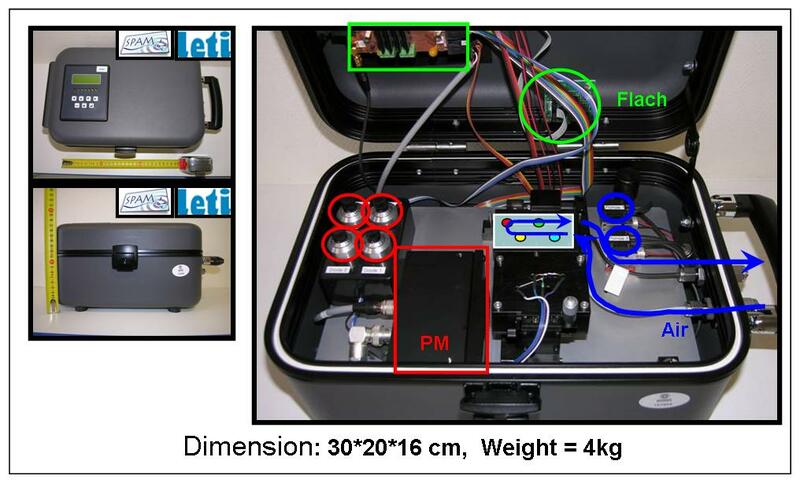 This is achieved with the prototype INDIGO produced by the CEA/LETI (Electronics and Information Technology Laboratory of the French Atomic Energy Commission ) at Grenoble with the collaboration of our team.